When shopping for salmon, look for a fish that was caught in the wild and is free of preservatives. Marketers like to try and trick you, so always look for the word “wild” as opposed to “Atlantic” or “Pacific”. Naming the waters they were raised in can be a way to trick you into thinking the fish is wild. USDA organic standard does not apply to fish. In a small pot whisk soy sauce, water, and cornstarch together until smooth. Add any of the optional additional ingredients you are using (vinegar, garlic, ginger, etc) . Heat over medium-high heat until warm and then whisk in honey until dissolved. Bring to a boil. Reduce heat to medium and whisk constantly until desired thickness is reached. Do not leave unattended it thickens quickly once it gets boiling and will rapidly burn. Taste and adjust as desired. If too thick, thin with additional water to desired consistency. Remove any bones from the salmon and discard. Place salmon in a bowl or shallow casserole. Cover with the teriyaki sauce. Marinate for 20 min. Meanwhile, trim roots from the scallions. Trim 2 bunches of scallions so that each scallion has only 1 inch of green. Place the trimmed scallions in a non-stick skillet with enough water to cover. Bring to a boil, lower heat, and cook until scallions are soft (about 5 minutes). Keep warm. 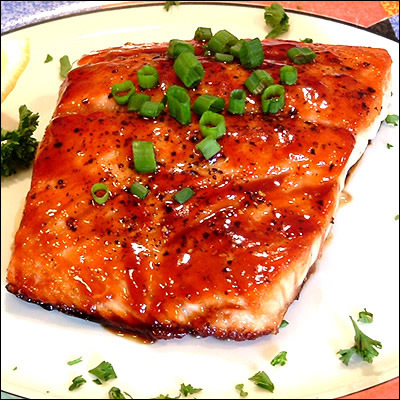 Remove the salmon from the marinade. Reserve marinade. Season each salmon filet with fresh cracked pepper. Heat 1 large non-stick skillet until very hot. Put the salmon skin-side up in the pan and cook over medium-high heat for 3-5 minutes. Turn over and cook for 3-6 minutes. The salmon will start to flake when done. Finely dice remaining scallions so you have ½ cup. Add to the reserved marinade. Add marinade and ¼ cup water to the salmon. Heat for 1-2 minutes, until well coated. Serve with the boiled scallions. ← FLOURLESS CHOCOLATE CAKE of LOVE….